I first found Trudeau last year when I reviewed one of their coffee mug, grater, and milk frother. I honestly love these products and especially use the coffee mug and milk frother often. This time around, I wanted somee more of their coffee mugs after loving the first one so much and I also chose a garlic press. 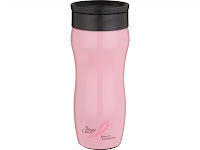 First of all, the coffee mugs that I reviewed are the Pink Sablier Travel Tumbler and the Boardroom White Travel Mug. I have been using these mugs for about a week and a half now and love them. My favorite is the white one because it looks business like and classy and keeps my drink hot. The pink mug is fun and trendy and perfect to use on the weekends. When I go to work in the morning, I am usually carrying a ton of stuff including my huge purse, laptop, binder, lunch, etc. Sometimes, I just don't have an extra hand for a coffee mug. One day, I made sure that the lid of the coffee mug was closed and put it in my purse horizontally. I kid you not, not one drop spilled! That is one of my favorite things about Trudeau coffee mugs is that as long as you have the lid closed, there is no leaks. Amazing! 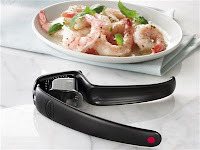 The other product that I reviewed was the Stress Less Garlic Press. The whole "stress less" idea makes it so that they product is easier to use and puts less strain on the hands and joints. This is great because some garlic presses are hard to squeeze and this one is not at all. It is a good quality one and easy to clean. Since I did not have one of these before, I am loving my new little gadget and will definitely be using more fresh garlic in my recipes. Once again, I am very impressed with the Trudeau products that I reviewed. I would be very likely to recommend them to people and will continue to use these awesome products in my own home. The giveaway will be for the Stress Less Garlic Press, Cheese Grater, Can Opener, and Pizza Cutter ($73 value) from Trudeau. Contest is open to US residents only. I really like the garlic press. Leaving a blog comment so i can enter your giveaway. amazing. I like the mixing bowls- fun colors and good sizes. I really like the Silicone Dual Egg Poacher. I really want that cheese grater, but I picked the Polypropylene Mixing Bowls / Measuring Cups & Spoons Set since you already reviewed the grater. i want that 2 in 1 oil/vinegar bottle! I like the Egg Poachers (2pc) & Egg Rings (4pc) Set. I like the garlic duo. I love the Fresh Herb Saver. I like the Silicone Splatter Screen. I like the gravy seperator. The vegetable steamer looks like something I could use- but ALL of them are great! I like the Polypropylene Mixing Bowls / Measuring Cups & Spoons Set. Price: $12.99 because of their RED color! Would love all of these products! all are great. I like the 2 in one Oil and Vinegar bottle. I like the utinsel pot clips. i like the soup on the go container. I like the Aroma Aerating Wine Pourer. 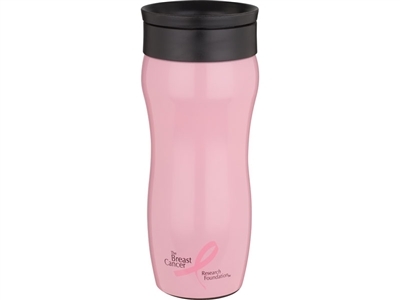 Drive Time BCRF Pink Travel Mug...it would be a great mug to use on trips! I would love the Elite Graviti Chrome Battery Operated Pepper Mill. I like the Measuring Cups & Spoons Set-Seriously, you can never have enough measuring utensils! The Vegetable Steamer would be great too. I like the Melamine Mixing Bowls Set! I love the Spice Rack - Quad: 16 Bottle Carousel. I love the 3 in 1 Lazy Susan Fondue Set! I like the Melamine Mixing Bowls set of 3.
i love the BCRF Pink Soup On-The-Go Container ! I also like the Silicone Splatter Screen . I would love to have the silicone dual egg poachers.